ETOOS Education is a professional education company that is equipped with the best infrastructure for university entrance in South Korea. 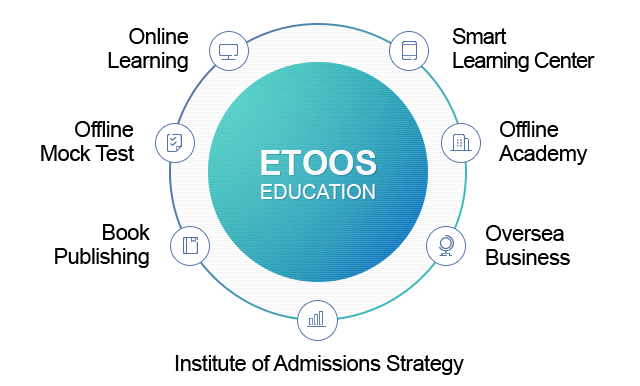 Currently, ETOOS Education which started as “Cheongsol Academy”, that is the brand of an offline educational institute, is actively conducting comprehensive educational businesses including publication, consulting and smart educational service using mobile device. The company aims to set up an institute in Kota (Rajasthan) , to turn the IIT hub into the Mecca of IIT JEE, Pre-Medical and CBSE Preparations. ETOOS has already brought about a revolution in the Indian education sector by introducing a unique and remarkable system to train the students. “Etoos” is a south Korean Company which is synonymous with excellence and performance in the field of education. After tasting success for over 20 years and establishing a proven track record, it ventured into the Indian market under the name, “etoosindia.com” to provide performance enhancing learning opportunity to students by collaborating with top faculties of KOTA, most of whom are IIT alumni. These faculties carry a first hand experience of undergoing and cracking tough entrance examinations and are focused on imparting quality education to their students so as to help them achieve their goals. It has already created a niche in the online education market by attaining a student strength as high as around 10,000 and still counting. Etoosindia’s online video lectures for IIT, AIPMT & CBSE, designed and delivered by these learned faculties, are comprehensive and facile to help the students comprehend them with ease. Our all courses is designed and developed by the experienced faculty of KOTA for IIT JEE Main & Advanced, Pre-Medical & CBSE. ETOOS is a gathering of the best Faculties in Kota. Anytime, Anywhere get access of video lectures prepared by Best Faculties Of Kota.